Haiti is the poorest country in the west. 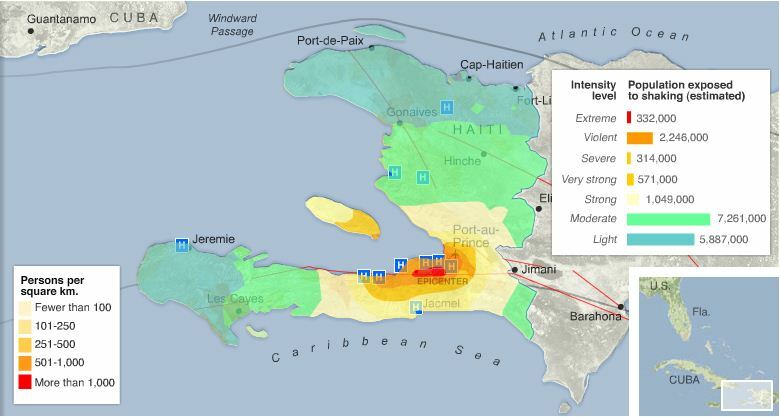 While culturally and environmentally rich, Haiti’s otherwise enviable location in the Caribbean Sea makes it extremely vulnerable to hurricanes and earthquakes. For much of its history, Haiti’s people have courageously waged a difficult uphill battle against natural disasters and challenging domestic politics that have hindered Haiti’s economic development. 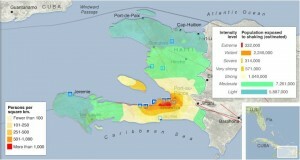 On January 12, 2010, Haiti was devastated by the worst earthquake to hit the region in 200 years. UNDP Human Development Index (HDI): 0.454 (2011, 158th in the world) HDI scores for the Dominican Republic, Honduras, Costa Rica and Mexico range from .604 to .750. Life expectancy at birth: 62.1 years (2011, UNDP Human Development Report). By comparison, life expectancies for Honduras, the Dominican Republic, Costa Rica, and Mexico range from 72.6 to 79.1 years. Haiti is the poorest country in the Western Hemisphere. World Bank data put Haiti’s GDP at just over $11.9 billion in 2011. With a population of 10.12 million people, that translates to a GDP per capita of only $1,179 (at Purchasing Power Parity (PPP)). On the order of 80 percent of Haiti’s population has been estimated to live below the poverty line. More than half of Haiti’s population lives in “multidimensional poverty,” meaning these people face constant, acute shortcomings in their health, education, and living standards, according to the 2010 UNDP Human Development Report (HDR). What little economic resources Haiti has are highly unevenly distributed. The 2010 UNDP HDR reckons that “multidimensional inequality,” including large income and gender inequities, reduces Haiti’s already low HDI score by about 41 percent. Haiti was one of eight countries cited by the UNDP where women receive less than half as many years of schooling as men. A host of political problems have hindered Haiti’s development and efforts to prevent or even respond to the natural disasters that seem to have the country so set in their sights. In 1492, Christopher Columbus claimed the island of Hispaniola for Spain. Now home to both Haiti and the Dominican Republic, Hispanola, Spanish for Little Spain, is the second largest island, by area, in the Caribbean after Cuba and the ninth most populous island in the world. In 1496, Spain established the first European settlement in the western hemisphere at Santo Domingo, which became the capital of the Dominican Republic. France’s King Louis XIV recognized the French colonies in Hispanola in 1665, and Spain ceded the western third of the island to France in 1697, as a consequence of concentrating its position around Santo Domingo to reduce the threat from Caribbean pirates. The new French territory of Saint-Domingue became the most prosperous colony in the West Indies on the backs of a slave society that supported a lucrative sugar cane trade with Europe. From 1802, the slaves staged a successful revolt against the French with the help of a yellow fever outbreak and declared a new independent nation of Haiti, meaning Land of Mountains, in 1804. The U.S. and European powers refused to recognize the new nation. When the U.S. enacted an embargo as collateral damage from its conflict with Great Britain and France demanded compensation for lost property, Haiti was forced to take on unmanageable debt that hastened its rapid decline into one of the region’s poorest territories. Haiti and the United States are separated by just 600 miles of Caribbean Sea at their closest points to one another. The United States is Haiti’s largest donor and trading partner. More than 15,000 Haitians received Visas to legally immigrate to the U.S. each year during 2007-11 according to the U.S. State Department.